The Arctic Wall is an airtight double-wall system using cellulose insulation and is designed to allow water vapor to diffuse through the wall. CCHRC recently tested a wall construction technique in the Interior that provides very high levels of insulation to maximize energy efficiency. 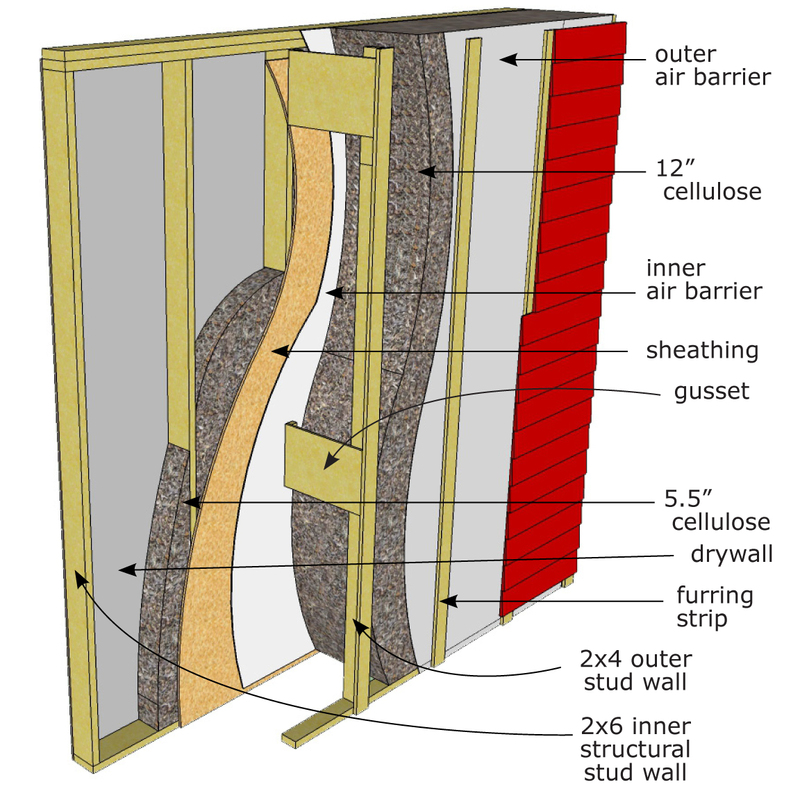 The Arctic Wall is an airtight double-wall system using cellulose insulation and is designed to allow water vapor to diffuse through the wall. The system was designed by Fairbanks builder Thorsten Chlupp and uses some of the principles of the REMOTE wall—another super-insulated building technique that places the majority of the insulation outside the load-bearing wall. Conventional cold climate construction calls for a vapor retarder on the warm side of the exterior wall. This vapor retarder typically consists of a layer of tightly air-sealed 6 mil polyethylene plastic sheeting, which keeps water vapor generated in the living space in winter time from getting into the exterior wall cavities. Installing a traditional plastic vapor retarder properly requires a high level of detail around all penetrations to prevent air and moisture movement through the wall assembly. This is a known weak spot for conventional cold climate construction. The Arctic Wall, on the other hand, has no plastic vapor retarder. Instead of stopping moisture movement with a barrier membrane, it works by remaining permeable so water vapor can move through the wall with the seasons, creating a super-insulated wall that can also “breathe”. CCHRC monitored the Arctic Wall’s performance over 13 months by placing temperature, moisture and relative humidity sensors in the walls. The goal was to determine whether the conditions would support mold growth, and how moisture would move through the walls. Test results indicated that both temperature and relative humidity levels in the walls were not sufficient to support mold growth. Neither side of the air barrier covering the exterior of the 2×6 structural wall ever approached the dew point (the point at which vapor condenses to water), indicating the structural framing is well protected from moisture. The relative humidity of the bathroom wall (the one likely to see the most moisture) never exceeded 65%, staying well below the risk level for mold growth. CCHRC also used moisture modeling software to predict how the walls would perform over a 9-year period, which showed that humidity levels and moisture content within the walls should not reach a level where mold growth would be a concern. Also noteworthy was the direction of moisture transport in the Arctic Wall—walls dried to the inside in the summer and to the outside in the winter. This is not possible with conventional cold climate construction. The Arctic Wall is a specific system whose components must be carefully engineered and built to ensure proper performance and moisture management. Based on CCHRC testing, the Arctic wall has done very well in Interior Alaska and provides a new option for a super-insulated house design. Posted in Ask A Builder and tagged alaska, arctic wall, CCHRC, cold climate housing research center, double wall, energy efficiency, energy efficient wall, fairbanks, Sustainability on August 22, 2013 by mrettig.